Juelz Santana had another run in with the law earlier this week, as the rapper was arrested in New Jersey on suspicion of making terrorist threats. The Diplomats member was also booked for disorderly conduct, according to TMZ. 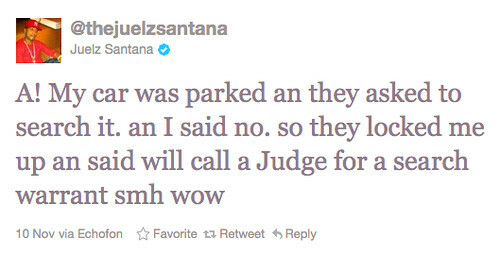 His vehicle was impounded after he wouldn't let cops search his car, according to police and Juelz's tweets. He was released on $46,500 bail.